If you are like me, you’ve lamented the low levels of respect paid to search engine marketers from the Midwest. When talking to our coastal brethren, being from Minnesota is met with a “flyover country” joke at best, and a “ya’ll have computers there?” at worst. Maybe we deserve it. Without a strong organization backing local search marketers, and with no coverage on the conference circuit, we haven’t always done a great job of promoting our profile on a national basis. It’s about time we changed that. The Minnesota Search Engine Marketing Association has been formed in order to raise the standard of quality of search engine marketing programming and talent in Minnesota. We will continue to put on great events, as well as a slew of other fantastic membership benefits. Since we first began accepting members into MnSearch at the beginning of this year, several brave souls have signed up to support our organization, a sign of commitment to the growth of search marketing in Minnesota. They will forever be known as founding members of MnSearch. Join other great Minnesota professionals and organizations! We are excited to have Josh, Bridget, Tim, Paul K, Smith, Jordon, Paul J, Tracy, Scott, Daniel, Alex, Bryant, Diane, Grant, Manos, Mariona, Mark, Robin and Shinhee be some of the first to step forward and join us on our adventure as well as these amazing organizations. Now it’s your turn. If you are committed to search engine marketing in Minnesota, sign up as a member today. It’s not too late to be named a founding member! Anyone signing up as a member now until July 31st, 2012, will be immortalized as a founding member of the Minnesota Search Engine Marketing Association. We also offer group memberships – so gather your friends or tell your boss to sign you up! Good Karma will follow. Member #1 (Josh) has even told me that the ROI of his membership has been 1000%. We had initially thought to ease into events by having them quarterly for 2011/2012. However, after the first few events we realized that that was not enough. We’ve decided to push ahead with more frequent events, sooner than expected. We’ll be posting an event schedule soon with an outline of monthly event dates to come that we’re calling “Search Snippets”. Feel free to contact us with any event ideas, topics you’d like to see covered, or general event related feedback. The great team at SpyderTrap created some snazzy member badges so that you can show off your membership level and spot other members online. As a special salute to our founding members, we even have a special Founding Members Badge that only original members will have permission to use. We’re committed to continuing to bring Minnesota more great search marketing events, but tickets will be limited to space on hand. 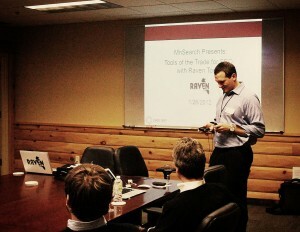 If you were at our January event on Tools of the Trade for SEO with Taylor Pratt of Raven Tools… 1st we apologize profusely for the heat!, and 2nd, you know that any event space will have it’s limits. We will need to limit future events to a venue’s capacity. But have no fear, members will always get first crack at obtaining tickets! Yes, membership does have it’s privileges! Shortly after the close of our founding member drive, we’ll be creating a permanent resource of all founding members that will remain here on our website. Forever. Until the end of the internet. It will be the web equivalent to bronzing each of you as a stature. Don’t wait, you have until July 31st to become immortal! We will continue to find and provide access to special offers and events to pass along to our members such as we did to SearchFest in Portland in February, the March Madness Basketball Tournament we held in March, the Hero Conf in Indianapolis in April, and the Online Marketing Institute’s Social, Mobile and Digital Marketing Boot Camp in Minneapolis in April. If you have ever seen SEOmoz’ Search Engine Ranking Factors or David Mihm’s Local Search Ranking Factors, then you know that the combined effort of several search marketing professionals can lead to the development of some great SEM resources. As an MnSearch member, you will have the option to participate in surveys and join community collaboration projects. We believe that helping members find and connect with one another is one of the main reasons we are here. And building a member director to show and spotlight members will help to accomplish that. Our sister associations SEMpdx in Portland and SEMNE in New England each have member directories, as well as our good friends at MIMA. So rest assured that we will too. Almost every association has their own unique conference that celebrates the industry and their members. We aim to have one as well. We’re initially referring to it as a “Summit” until we come up with a more fitting name. Maybe “SearchPeak”, “SearchCon” or “SearchParty”? No, probably not. We’ll, regardless of what we end up calling it, members will always receive discounts and advanced ticket access to “Searchapalooza”. No? Okay. Don’t Hesitate. Become a Founding Member Today! So what are you waiting for? Join now before our Founding Member Drive ends on July 31st. If you need help, email me (Jeff at MnSearch dot Org) or Jolina Pettice (Jolina at MnSearch dot Org) for more info! Jeff Sauer is a Board Advisor for MnSearch. Jeff is also the Vice President at Three Deep Marketing in St. Paul, MN and author of the popular Digital Marketing Blog Jeffalytics. Teacher, Speaker and passionate marketer, you can find Jeff on Google+, LinkedIn and Twitter.